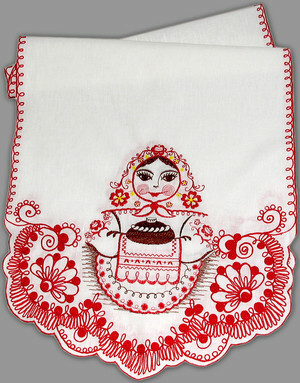 Rushnyk (ritual cloth) is one of the obligatory and main symbols of many ceremonies in Russia, Ukraine and Belarus. Rushnyk handmade embroidery has a meaning of life, a long way which a person is supposed to go through. There are many hand embroidered rushnyk that are used at birthday, baptizing, wedding, guests welcoming, funerals. 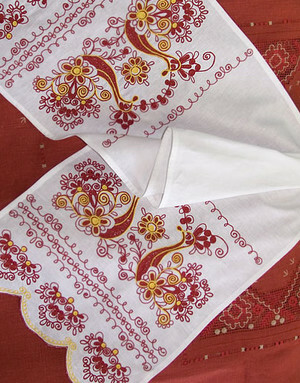 Every rushnyk has hidden meaning behind embroidered patterns and is often decorated with fancy handmade lace. 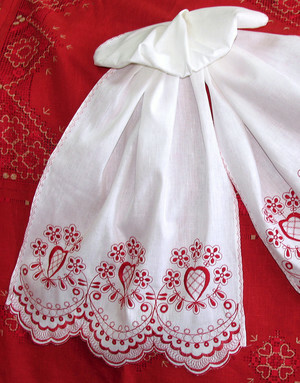 Many rushnyk symbols can be found on Ukrainian embroidered shirts. The power of the rushnyk comes from the sacred act of embroidery. Rushnyk cloth also held a place of honour among the interior furnishings. Today rushnyk is mainly ordered on occasion of Russian and Ukrainian wedding. Every rushnyk may be embrodeired with the names of a newly married copule and a date of the wedding.